Devices powered by Apple Inc.’s iOS mobile operating system outnumber by wide margin machines running on other platforms, according to a recent survey by Citrix Systems. 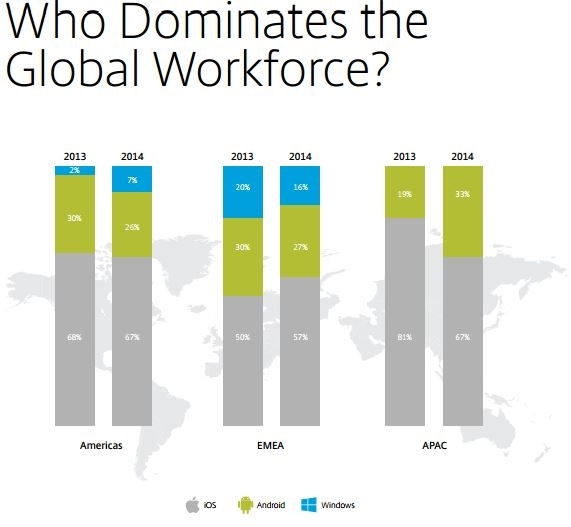 Globally, iOS device account for more than 64 per cent of mobile devices in the workplace as of 2014, according to the Citrix Mobile Analytics Report for the first half of 2015. By comparison, Android powered devices hold just 27 per cent of the market share and Windows mobile devices account for a mere nine per cent. This report is an analysis of anonymously sourced information encompassing both mobile subscriber and business mobility data drawn from a global cross-section of Citrix customers. Data sources include the ByteMobile traffic reporting solution and the XenMobile enterprise mobility management solution. Even in the 2013 figures, iOS devices still enjoyed a strong lead other operating systems in the Americas, Europe, Middle East and Africa (EMEA) and the Asia-Pacific (APAC) regions, according to figures from Citrix. However, different industry verticals tend to favour certain systems. For example, iOS handsets account for 71 per cent of devices in the financial industry, while 39 per cent of device in the healthcare industry run on Android. 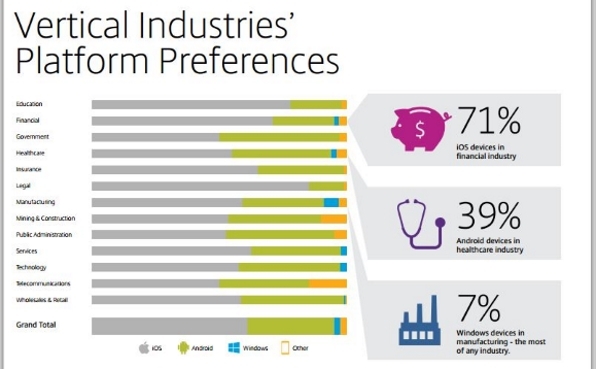 Windows mobile OS has its largest presence in manufacturing. “Traditionally iOS devices have been the gold standard for mobile device security,” said Kevin Binder, senior product manager for XenMobile. He said this reputation, is likely the reason why iOS dominates the financial sector. On the other hand, the popularity of the lower-priced Android devices in the healthcare sector may stem from cost cutting pressures many organizations in this space are facing. Device diversity is also a reason why Windows mobile OS enjoys a wider acceptance in the manufacturing sector compared to other spaces. 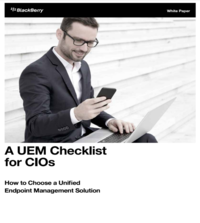 A key takeaway of the OS split is that enterprise (particularly global enterprises) need to look for enterprise mobility management (EMM) solutions that are device agnostic. Binder said OS preferences are constantly shifting and changing. “IT needs a common set of management tools that will allow them to apply device level and application level policies to all device types with complete feature parity,” he said.